27/02/2018 In the Mid-Sweden town of Kil, a state of the art car construction project is in progress. 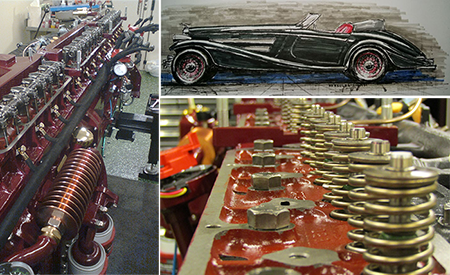 The motor enthusiast Pelle Söderström is in the final phase of finishing his childhood dream; the world´s first and only straight 16-cylinder car engine. The gigantic engine contains specially designed valve springs from Lesjöfors. The technically interested Pelle Söderström got inspired to the massive engine construction already in the late 60’s by a TV-show called “Herkules Jonssons storverk”, a story about a boy who carries out great achievements in different fields. Pelle´s dream was to build an own-designed car inspired by the 30´s with a straight 16-cylinder engine, a project no one in the world had ever done before. However, it wasn´t until the summer of 2012 that his ideas could start to convert into reality. Pelle named the extraordinary project “Herkules 1934”. Since then, Pelle has put thousands of hours and a lot of money into planning, constructing and documenting the project. Pelle Söderström is now in the last phase of the engine construction. The last piece that remains is to find a solution for the ignition cables. Nevertheless, taking a well-deserved break after that is not on his to-do list. Next step will be to build customized fellies, construct the chassi and then the auto body. Pelle doesn´t have a time schedule for when he expects the car to be ready. “It´s ready when it´s ready. My focus is to build my car just the way I dreamt of. My motivation is to create something unique, something that has never been done before. We´ll see, I might be able to take the car to the Mediterranean one day when I´m retired”, says Pelle Söderström.